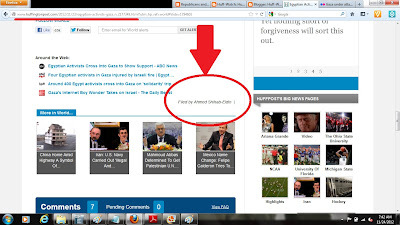 Huff-Watch: Is HuffPost even more anti-Israel than the Iranian regime is? Yes – and here's the proof. Background: Over the past thirty days, we, The Algemeiner, and our friends at HuffPostMonitor have been documenting and exposing the fact that HuffPost --- the world's #1 most-read online "newspaper" --- has been enabling the "host-producer" of its video "news" programming, Ahmed Shihab-Eldin, to spread inflammatory lies and propaganda against Israel, over and over and over and over again. This is not surprising, since Shihab-Eldin is also a former "host-producer" for Al Jazeera*, an outfit that is almost as anti-Israel as HuffPost. On November 23, HuffPost stooped to an entirely new low --- and revealed itself as being actually more anti-Israel than Iran. HuffPost did this by enabling Shihab-Eldin to use a grisly photo of children's corpses to post an extremely inflammatory lie about (a) the nature of Israel's Operation Pillar of Defense, and (b) the number of Palestinian children killed during this campaign --- citing figures that even Iranian propaganda (and the Palestinians themselves) reveal is a lie. 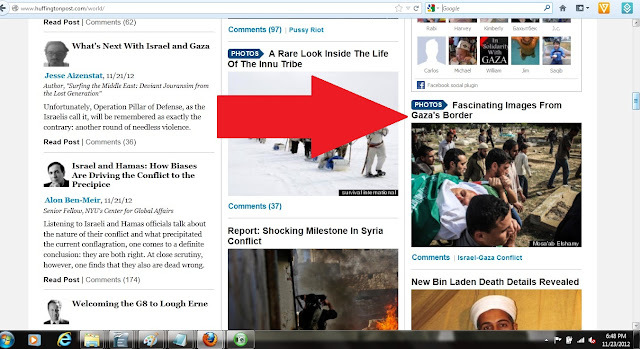 "Fascinating Images From Gaza's Border"
On that page is one of HuffPost's infamous "slide shows," which often reveal nothing but the heart-wrenching photos of dead and (supposedly) injured Palestinians, but rarely if ever pictures of the Jewish victims of Islamist savagery. "Over half of the victims of the Israeli aggression were children." (1) "Operation Pillar of Defense" was not Israeli "aggression," as HuffPost knows well, it was a defensive action to stop Hamas and allied groups from firing nearly a thousand rockets, missiles and mortars into its civilian population centers. 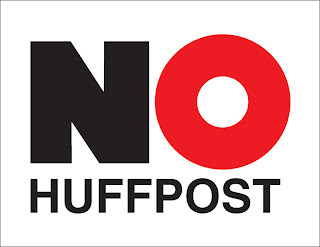 Of course, if one only relies upon HuffPost for one's news, he or she would not know that --- because as we documented here, HuffPost refused to publish a single story on its front page or Wolrd page about the incoming fire coming from Gaza. Instead, HuffPost began to publish stories about this conflict only when Israel began threatening to take strong defensive action to put a stop to it --- which, of course, HuffPost framed as "aggression." This is just one more of HuffPost's pathological efforts to incite hate against Israel and Jews on false grounds, and (2) to protect militant Islamists from being held to public account for their threats and violent actions against them. (2) HuffPost knows (or should know) that children constituted a very small percentage of those killed in Israel's defensive campaign, which was initiated for one purpose: to stop Hamas's and allied groups' deliberate attempts to murder Jewish civilians. 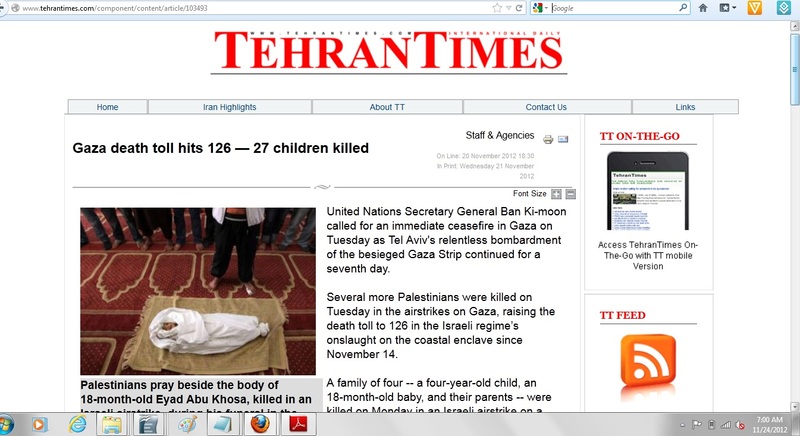 According to Iran --- the murderous regime that supplies weaponry, funding and jihadist motivation to Hamas and Hezbollah --- only 27 out of 126 "victims" in Gaza were children. For the math-challenged elites at HuffPost, that is 21%. Posting phony pictures of dead children that were actually killed by its own misfired rockets and missiles, or were killed elsewhere, such as in the Syrian civil war. Claiming that "children" include teenage males who, in one moment, were helping to fire rockets and missiles into Israel, or otherwise engaging in terrorism, yet when the "news" cameras come by, they revert back to "civilian" status --- which HuffPost dutifully promotes, as perhaps painting peace signs on a wall. 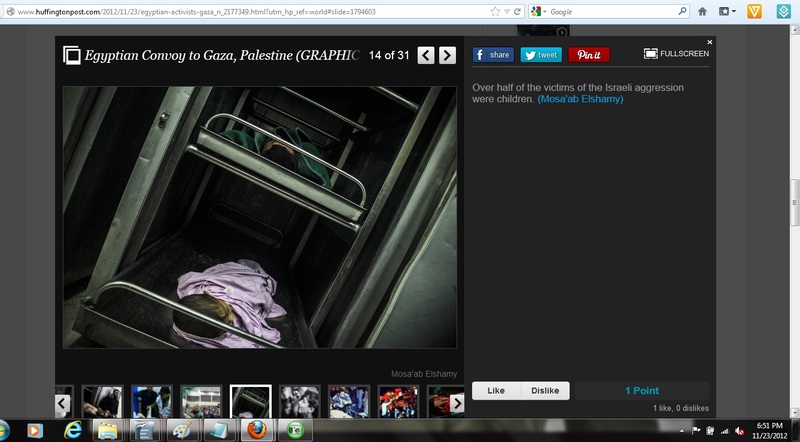 To be clear: Every child's death amidst a military conflict is a tragedy, no matter which side causes this to occur. But in this conflict, one side openly admits to, and celebrates its use of children as human shields, while the other is working valiantly to protect children from harm --- even those of the enemy. The most startling fact about Israel’s performance in the eight days’ war in Gaza is the one about which the most egregious lie is being told by western commentators. This is the astoundingly low proportion of Palestinian civilian casualties. According to the IDF spokesman last evening , 177 Palestinians were killed in Operation Pillar of Defence, of whom 120 were ‘engaged in terrorist activity’. That total is a tiny number of deaths from 1500 air strikes. It also means 57 civilians were killed along with the 120 terrorists. That is a ratio of more than two terrorists for every civilian killed. When you consider that in Afghanistan the ratio was three civilians for every one combatant killed, and in Iraq it was four civilians for every one combatant killed, you can see just what a staggering feat of precision the Israelis achieved. This is even more astonishing given that the Hamas situated their rockets and ammunitions in the middle of civilian areas. This precision was acknowledged yesterday by American journalist Anderson Cooper, who was interviewed by Wolf Blitzer of CNN after Cooper arrived in Israel from Gaza. Acknowledging that some people would disagree, Cooper said that it was very clear that the IDF clearly knew exactly what it was targeting. Palestinians knew it, too, he said: some of them would go outside to watch and even photograph the attacks, because they knew they were not either the targets or the object of indiscriminate fire. The bottom line was that the Israelis were making clear efforts to hit only military targets. How does this all compare to Arianna's claims that HuffPost is a professional "newspaper," and better than its competitors? "[At HuffPost] there are guidelines that have to be followed -- and they include a prohibition on... inflammatory claims."